Each week Mr. Kalin began delivering a message to the group, telling personal stories of his own challenging middle school experiences. This took a lot of courage, especially at first when the students weren’t very receptive. 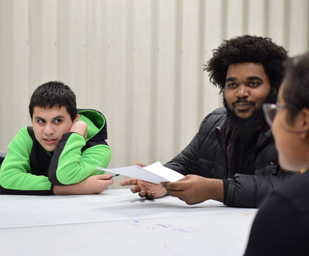 But Mr. Kalin kept showing up and now believes the narrative is beginning to change, “Recently I gave a talk and the main point was about learning to love yourself so that you can love your neighbor well to help overcome hardships, mistakes, insecurities and heartbreak. Afterward, we broke into small groups with the students. Initially they were quiet, until Ramon decided to open up. “Ramon began to express how low his love for himself really was. He asked a lot of questions about how someone could love themself. Then finally asked, ‘How can I love myself the way Jesus loves me?’” Mr. Kalin recalls. This took a tremendous amount of courage to ask in front of his peers. Mr. Kalin believes that seeds of love, hope, and self worth were planted during the talk that day, “To be vulnerable and love yourself takes a very courageous person,” Mr. Kalin comments. After months of being courageous and vulnerable himself – getting little to no feedback from the students – Mr. Kalin kept showing up, being courageous and sharing his story. His example eventually built trust and helped foster a safe space of sharing.